← Save Up To RM 6 Today!!! You can always trust a rabbit to give you directions to safety and that is if you are small enough to fit into its burrow. In the movie The Matrix, a white rabbit is used as a reference for Neo to find Morpheus and to seek the answers to his questions about life. In the story Alice In Wonderland, a rabbit lead Alice into the world of uncertainties. My life thus far has been filled with many interesting experiences and adventures. Not all evolve around rabbits but sometimes the signs can indicate otherwise. Rabbits have certainly brought many good friends into my life both abroad and locally. The 89th ARBA Convention will be held at Wichita, Kansas next week and though I have no plans to attend, the ARBA Convention is something I really look forward to and if given the opportunity again, I will not miss the chance to visit all my friends in USA. I am not sure about you but I do notice that the more you are interested in something, the more intuitive you will be to notice that particular thing that you are interested in. Similarly to myself as I will always look out for anything rabbit. 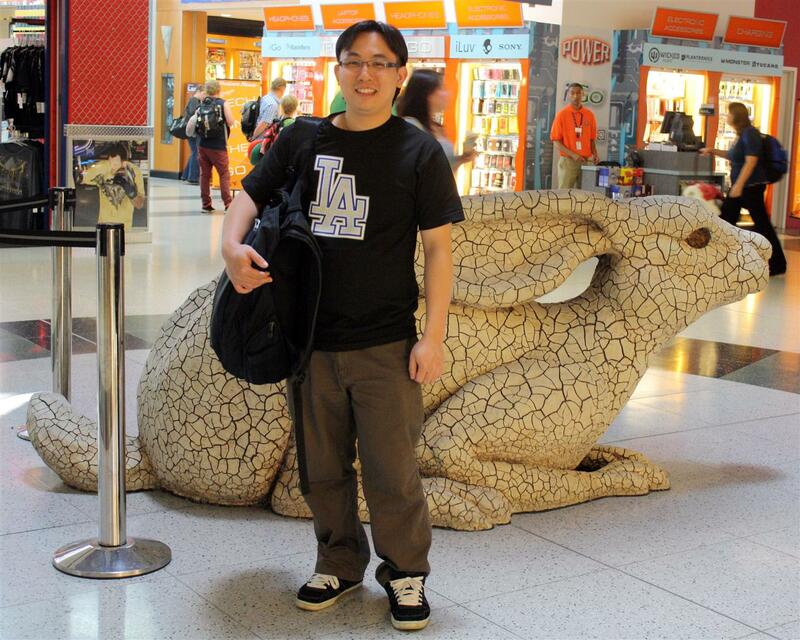 During one of my travels recently, I was greeted by a bunny at the airport though I was strictly on business. And this tickled my heart and made me realize how much my life evolves around rabbits. Like Neo and Alice, I take that as a direction for me to continue on with life’s many uncertainties and wonderful experiences. I am going down the rabbit burrow, what about you? Another wonderful trip and another amazing experience! Here wishing all traveling to the 89th ARBA Convention safe travels and all the best!